In the latest stage of its national expansion, GAC Brazil has opened a seventh office to offer its shipping, logistics, bunker fuels and marine logistics at one of the country’s newest and rapidly growing port complexes, in the north of Rio de Janeiro State. The new office, which officially opened in late July at Sa~o Joa~o da Barra RJ, covers operations at the Ac¸u port complex. Located 315km north of Rio de Janeiro city, Ac¸u has ten berths, with plans to add a further 20, and at 21 metres, is deep enough to accommodate some of the world’s largest freight vessels. 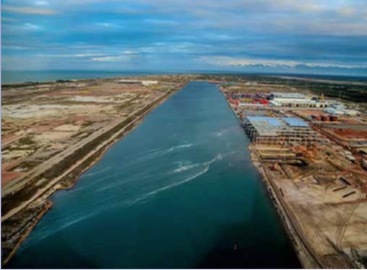 “The Ac¸u Port is expected to become one of the largest port complexes in Latin America. The combination of commodities and activities related to shipping and logistics is definitely a great opportunity for GAC Brazil to showcase its main assets to the local market. Having this scenario, we can assure our customers that GAC is a reliable option as our shipping team has a distinctive blend of dry bulk and O&G specialists,” says Rodrigo Kill, Shipping Manager at GAC Brazil. GAC serves the Brazilian shipping and logistics markets from its headquarters in Sa~o Paulo, and six branch offices in Angra dos Reis, Macae, Recife, Rio de Janeiro, Santos and now Ac¸u. The Group also serves the Latin America market through its operation in Trinidad & Tobago.